​The website for the stunning Intercontinental Hotel Park Lane London has been voted the World’s Leading Hotel Website at the recent 2018 World Travel Awards. The elegant five-star Mayfair hotel sits on the site of the Queen’s former childhood residence in the heart of London, located between Mayfair and Knightsbridge in view of Buckingham Palace. 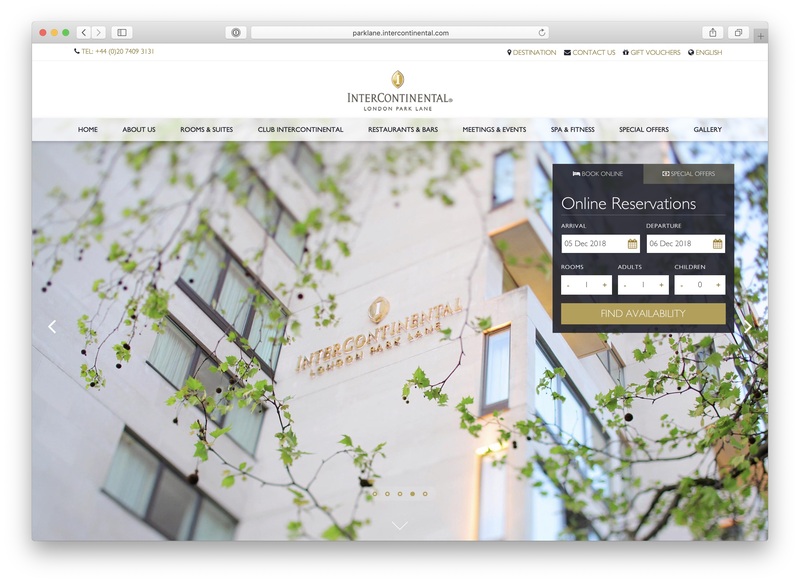 The Bookassist Web Design team built the Intercontinental Hotel Park Lane website as a responsive, modern, elegant presence to reflect perfectly the personality of this stunning Intercontinental property. The site employs modern design techniques such as parallax and auto-collapse elements, a design mix of full width and limited width content sections, and the use of image boxes to highlight the main elements of the property, all the while being highly optimised for digital marketing and booking conversion. Bookassist also delivered a restaurant website for the property and an intranet site.